Research Papers on the District of Columbia v Heller will discuss the Supreme Court case that the Court, by a 5-4 decision, ruled that individual citizens did have the right to possess firearms, largely without restriction, for lawful purposes, such as self-defense. Supreme court cases that examine the constitutionality of various proposals are frequently written about by the writers at Paper Masters. Our legal and judicial writers examine cases such as DC vs. Heller and explain their outcome in a case brief or in a complete research paper. One of the more recent landmark Supreme Court cases is District of Columbia v. Heller, in which the Court, by a 5-4 decision, ruled that individual citizens did have the right to possess firearms, largely without restriction, for lawful purposes, such as self-defense. This ruling was issued on June 26, 2008. Specifically, it struck down part of the Firearms Control Regulation Act of 1975 as unconstitutional, based on a majority interpretation of the Second Amendment. Within the boundaries of Washington, D.C., the Firearms Control Act restricted residents from owning handguns, and that all rifles or shotguns needed to be unloaded, disassembled, or secured with a trigger lock. In 2003, six DC residents filed a lawsuit, challenging the constitutionality of this law. Eventually, the case reached the Supreme Court, the first time since 1939 that the high court had chosen to rule on a Second Amendment issue. The case was controversial on both sides of the gun issue. The amicus curiae brief affirmed that the ban on firearms by Congress should be overturned. Oral arguments took place on March 18, 2008, with the ruling issued, as tradition, at the end of the Court’s term in June. The Court decided that the 2nd Amendment does not guarantee the right to keep and carry any weapon for any reason at all, but that there can be no restrictions on handguns for lawful intent. 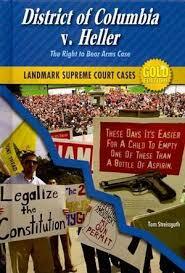 Right to Bear Arms - Right to Bear Arms research papers cover the Second Amendment. Gun Control Legislation - Research papers on Gun Control Legislation discuss one of the most controversial aspects in modern American culture today. United States Constitution - The United States Constitution research papers outline the goals of the United States Constitution. First 10 Amendments - The controversial Second Amendment guarantees the right of the people to keep and bear arms. Tucson Shooting - Saturday January 8th, a lone gunman named Jared Lee Loughner opened fire at a Congress on the Corner event being held by democratic congresswoman Gabriel Griffords of Arizona. Gun Violence in America - America's love affair with guns finds its root in the Second Amendment, which establishes the right of the people to bear arms. First Amendment Rights During Wartime - First Amendment Rights During Wartime research papers look at the history of the First Amendment during wartime. Shootings and Gun Control - The topic of gun control and the recent wave of shootings in high schools and the workplace needs to be explored by college students. Paper Masters writes custom research papers on the District of Columbia v Heller will discuss the Supreme Court case that the Court, by a 5-4 decision, ruled that individual citizens did have the right to possess firearms, largely without restriction, for lawful purposes, such as self-defense.